International food manufacturer in Jefferson, WI. 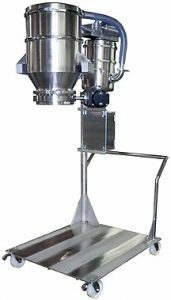 Company was introducing three new LIW feeders into their condiment feeding line and needed a hygienic and accurate method of refilling each feeder with different products from a remote location without interfering with the scale system. The refilling area had limited headroom (<8’) as well as limited floor space. CIP was not possible, so the feeders and refill systems would need to be easily removed from the area for cleaning and maintenance. IEDCO provided three new, large storage hoppers with integrated pneumatic feed wands in a nearby room which allowed bulk quantities of the products to be ready for feeding the new refill system. In order to satisfy the feeders refilling requirements while taking into consideration the height/space restrictions, IEDCO introduced a custom, low-profile pneumatic conveying system for each feeder. These specialized pneumatic conveying systems were also mounted on a mobile cart that would also hold the LIW feeders. Since the feeders had an open top and a contained transfer process was desired, custom covers were created that allowed the transfer of material from the pneumatic conveyors to the feeders in a closed system. A flexible connection was used to not interfere with the weighing process. Using a precise system of controls and level sensors, the feeder refilling process was now an accurate, automated, and contained system. 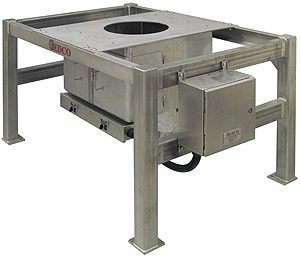 The new IEDCO feeder refill systems eliminated long, manual refilling operations while increasing hygiene and efficiency with its closed and contained design. The portable cart design allowed for easy positioning of the feeders for processing, as well as simple removal for cleaning and maintenance. Frozen meals food manufacturer in Jackson, OH. Company began receiving many ingredients (dried pastas and other food materials) in large Gaylord boxes and needed an efficient, low-manpower method of transferring the ingredients to their process without damaging the product. IEDCO provided six Gaylord tilters with custom, pneumatically operated vacuum feed wand holders. These attachments moved the feed wand up and down during the vacuum cycle for maximum feeding efficiency and bridge breaker without the need of an operator. Six pneumatic conveyors were provided to transfer the materials from the Gaylords into the various process systems. Using dense phase conveying and a large flapper valve as the discharge feeder, we were able to transfer the different and delicate products without damage. The new IEDCO pneumatic conveying systems provided the necessary gentle product transfer without the need for multiple operators. The system was both efficient and cost effective. Specialty nutritional foods manufacturer in Wautoma, WI. Company needed to dispense milk powder from bulk bags into a processing suite, but, due to the height of the processing equipment stack-up, the bulk bag discharging operation needed to be on the floor above and in a room with a standard ceiling height of 8’. IEDCO provided a low-profile bulk bag unloader that discharged the bag’s contents through the floor and into the processing system on the floor below. A chute system was devised that could interface with the process system which featured an auger filler with varying operating heights. 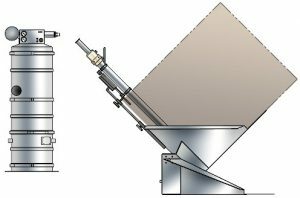 The IEDCO bulk bag unloading system featured a sanitary rotary valve that allowed for a controlled feed into the auger filler. The new IEDCO bulk bag unloader allowed the customer to discharge bulk bags in a controlled manner in an area with limited headroom in which no standard bulk bag unloader could fit. Utilizing the existing environment, the current processing stack-up did not need to be disturbed.